When I was a little girl, I used to write my own version of Little Golden Books - you know those wonderful children's books that introduced so many of us to the pleasures of reading? I made up stories about my brother, my pets and school friends, etc, illustrated them very badly and stapled them together. All those years ago, I'd fancied myself as a bit of a writer. But then I became a teenager and going out with friends, meeting boys, moving out of home, and the roller coaster that real life becomes sort of took over. Before I knew it I had a career in the financial services industry and writing wasn't even a glimmer on my horizon. My dad always wanted to travel. He told me once that his dream was to go to Kakadu. Dad was a plumber, who worked hard to provide for his family. When Mum decided she wanted out of the marriage, Dad didn't know what had hit him! It was around this time that I pulled up stumps and moved to England to live with my Grandma Olive in a small Yorkshire village called Otley. Those of you who have read Torn and Inviolate will know all about Otley except that it's called Wolstone in the books. By the time I returned to Australia, Dad had sold the family home, paid Mum her share and decided to start all over. The poor guy was in his fifties. One day he said to me, "I wish I could find a cave somewhere ... Some place where I can live peacefully. I'd have a few chooks and a veggie patch and I wouldn't have to worry about anything ever again." Dad rented a little place for himself and his dog, Thommo, and kept his head down for the next decade. Working, working, starting from scratch, trying to build some kind of life as retirement approached. At sixty, Dad finally gave up plumbing, took his superannuation and retired to a cottage in Eildon, Victoria. He finally had his 'cave'. For the first time in his life, I think my dad was truly happy. He grew his veggies, he participated in local events, made new friends and he and Thommo became local fixtures. I loved going to visit him and sometimes I would take my dog Tess, and stay for a week or so - just hangin' out with Dad. When Dad was around 62, he mentioned Kakadu again. He said to me, "You know, I'd love to get a camper van or something and me and Thommo can just take off ... go up north and finally see the place." I said, "Why don't you? Just go! What are you waiting for?" But he kept putting it off. He always had something else to do: the house needed painting, the garden was getting out of control the ... blah blah ... whatever ... I gave up nagging him. At 67 Dad was diagnosed with non hodgkin's lymphoma. He passed away just after his 69th birthday. He never got to see Kakadu. With that said, I'm going to leave you for this week - I've run out of time today. But I do want to talk more about this topic next week. I'm going tell you why I think life really is too short and, more specifically, why you must follow your dream. 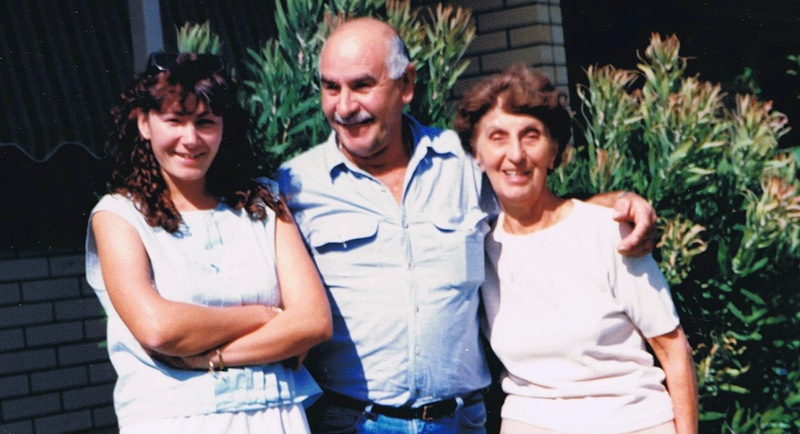 This is me with Dad and his mum, my Grandma Kay. She always wanted to go home to Italy but never achieved her dream either.